Start a big flavored barbecue with a sweet chilled first course soup. Now that warm weather has arrived, we are finally firing up our grills and smokers and loading them up with ribs, chicken, brisket, fish and burgers. To help you with your next meal, I’ve created a set of four grilling spices and a barbecue sauce that’ll add a little extra kick to whatever’s on your menu. You’ll find the link to the recipes below. I usually double or triple the recipes so I have enough to last a good part of the season and to portion out in smaller bottles for friends. They make great gifts. Because these recipes add quite a bit of spicy flavor to anything you’re grilling, this mango carrot coconut soup is the perfect first course. The sweet tartness is a nice contrast to the smokey grilled flavors of your main course. It ’s also a perky palate cleanser if you’ve had appetizers before starting your meal. Also, because the soup can be made early in the day or the day before, it’s worry free once your guests arrive. Place ginger in a heat proof bowl and set aside. Place carrots in a small pot. Add 3 cups of water just to cover and bring to a boil. Reduce heat and simmer for 10 minutes. Turn off heat and carefully pour 1/2 cup of the hot liquid over ginger. Strain carrots and discard remaining liquid. Allow carrots and ginger water to cool. Take about 1/2 of one mango and make a small dice. Toss in 1/4 of the lime juice and set aside. Put remaining mango in a blender. 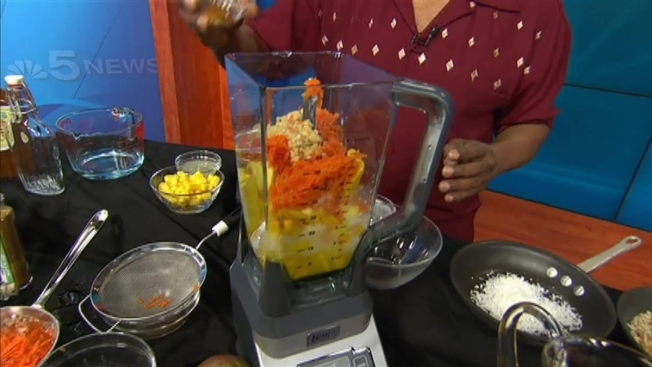 Add cooled carrots, ginger and water, orange juice, coconut milk, cumin and remaining lime juice. Puree ingredients until fully blended, about 1-2 minutes. Remove from blender and refrigerate for at least 2 hours before serving. Meanwhile, place shredded coconut in a dry saucepan over medium high heat. Constantly stir with a wooden spoon until coconut begins to brown. Watch carefully. Coconut will burn very soon after browning. As soon as coconut lightly toasted, remove form heat and transfer to wax paper or a paper towel to cool. To serve, pour soup in chilled bowls or glasses and top with a bit of diced mango and coconut.